Costa Navarino is the prime sustainable destination in the Mediterranean. 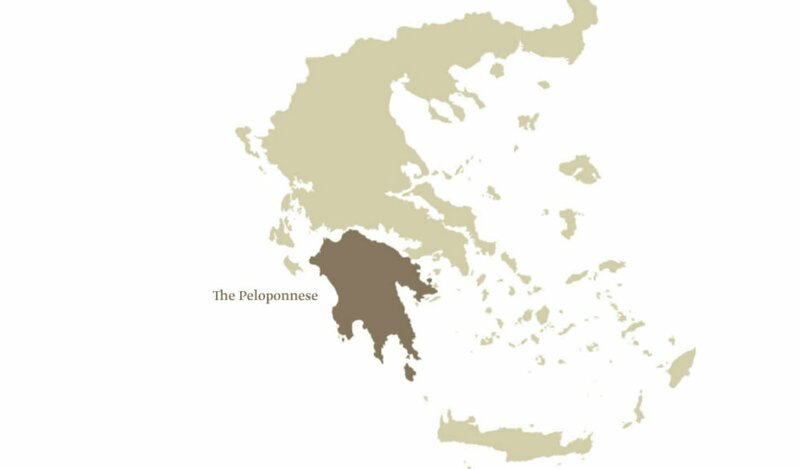 It consists of a number of distinct mixed-use resorts, the first in Greece, integrating deluxe hotels, signature golf courses, world-class spas, state-of-the art conference facilities and high-end private residences. 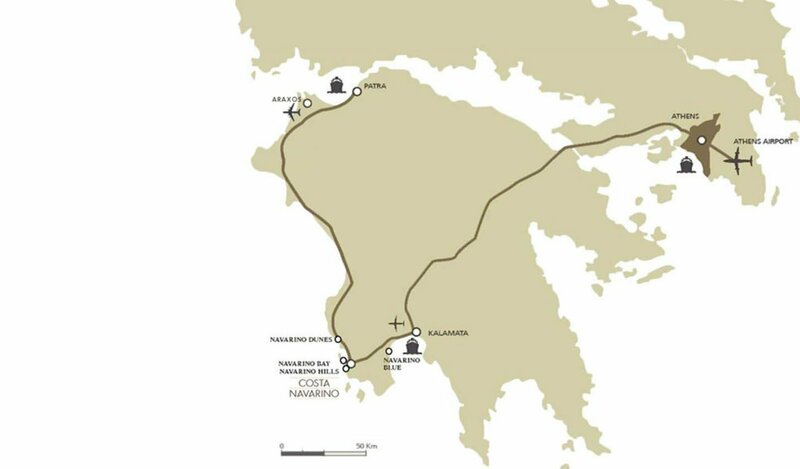 Upon completion Costa Navarino will comprise 5 sites, complementing and not competing against each other, extending over 1,000 hectares in total. Navarino Dunes, the first area in operation, features two 5-star resorts, two signature golf courses, the award-winning Anazoe Spa, and Navarino Residences. The second resort site, Navarino Bay, is home to an 18-hole signature golf course, The Bay Course, in operation since 2011. Navarino Dunes includes two luxury resorts, a spa, a signature golf course, specially designed children’s facilities, the Agora shopping area and 21 restaurants and bars all set in a unique, unspoiled, natural environment with a long history and cultural heritage. Νavarino Bay - 140 hectares - is home to The Bay course. Further developments will include the Navarino Bay course Clubhouse and the first earth-sheltered architecture resort in Europe featuring an ultra-luxury hotel, pool villas, a distinctive spa and an exclusive beach club. Future Development - 15,8 hectares: A green and vibrant lifestyle resort with lagoon-pools and beachfront townhouses, linked to a waterfront Agora area, along the lines of a picturesque seaside town, featuring a variety of dining, shopping and entertainment options such as an outdoor cinema. Future Development - 500 hectares: A plateau with amazing views over the Bay of Navarino and the surrounding rolling hills will become the venue for two new 18-hole golf courses. At a later stage, Navarino Hills will also feature additional innovative tourism and recreation facilities . Future Development - 210 hectares: Located on the Gulf of Messinia with a 1 km south-facing sandy beach, within close proximity (10-minute drive) to Kalamata International Airport. This location is reserved for a family resort, offering a plethora of sports, leisure and entertainment activities. International Airport of Kalamata “Captain Vassilis Constantakopoulos”, one of the fastest growing airports in Europe, located only 45 km from Navarino Dunes. 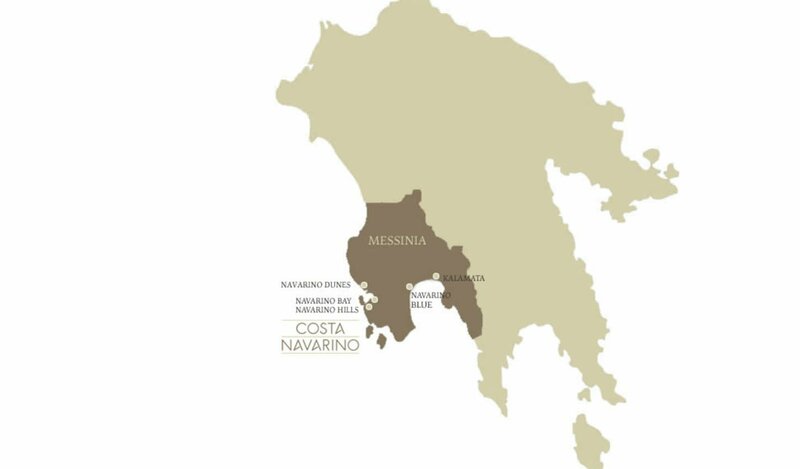 Navarino Vineyards are the destination’s organic vineyards located in an area covering 55 hectares, extending over western hillsides 500m to 600m from the sea. Our grapes produce award-winning red and white vintages that are bottled and stored in the Costa Navarino cellars. Planted with centuries-old trees. The organically farmed olives are carefully harvested the traditional way, by hand without the use of mechanical means, to ensure production of award-winning Navarino Extra Virgin Olive Oil from Koroneiki variety olives with the lowest acidity. Potential redevelopment of an old monastery into a health retreat. Potential redevelopment of an old traditional Messinian village into a hideaway resort.